Looking for help on how to use the system? Who to contact uniforms? Consider this our overall FAQ session for all volunteers. ...talk to someone about social media or adding stories to our site? ...find someone to pay our tournament fees? ...get help updating my USA Hockey roster? Looking to send an email to the Capital Wolves hockey community or a specific team? Here's how you do it. > Select the group you want to email, then click 'Submit' at the bottom. Typically you would select your targeted team on the right handside, as shown below. 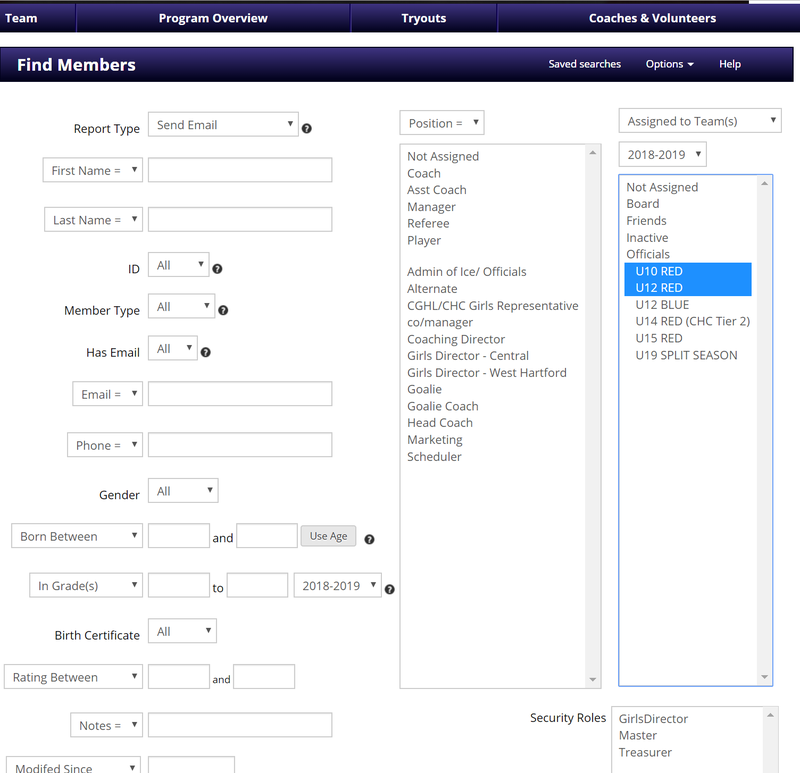 To select multiple teams, hold down 'ctrl' and click on each team. > From the next screen you can compose your email. Use the 'View Addresses' button to double-check the email list you're sending to. > Click 'Send' to send the mail. You can also click 'Preview' to double-check the format/content of your message. Who do I ask about uniforms or equipment? Please reach out to our Equipment/Uniform Director, Andrea Sweeney, via before contacting our vendor, Hamden Sport Center, or contact us at . Who do I ask about social media, or updating our site with stories/pictures? Please reach out to our Social Media Director Director, Marci Moskal, via , if you have any questions about social media. Do you have pictures to share? Do you want to post a story on the site about the weekend's action? Are you interested in helping with our social media account for your team? Marci is the person you're looking for. Who do I ask about getting our tournament checks submitted? Any in-season tournament request should be first approved by Marc Labrie, and once approved please contact our Treasurer, Peter Martin, via email. He can be contacted using the Email feature on the West Hartford site, linked here. Who can help me update my USA Hockey roster? Please reach out to James Busi, our overall Registrar, to request any updates to your USA Hockey roster, including coaches and alternates. He can be contacted using the Email feature on the West Hartford site, linked here.